When we used to deal with the topic of India's population, and the issue of child labor, as young, adolescent students, we almost always imagined the errant parents as being vultures, out to make a quick buck by sending their kids off to some God-forsaken workplace and making them work their lives off. We felt that the parents perhaps always look upon their offspring as just another pair of hands - one mouth more to feed, but two hands more to work. No doubt some cases of such inconsiderate parents might exist, but what I realized, over a short rural jaunt, was that that cannot be a generalization. This could be a trend in AP alone, but almost every rural inhabitant we spoke to, sent their kids to school - male and female kids, both! I must say, that fact was truly refreshing to note. They sent their kids to elementary school, and if the government school was not as good, they took the pains of sending their kids all the way to the next big town to study at a private school. Some even sent kids to a residential school. If a large factory was located in the village, the powers-that-be of the factory ensured that a good school like a DAV (which is a rather prestigious school in south India) could come up in the vicinity. And the rural population, was more that willing, if not happy to send their kids there. Some even ensured they sent their kids only to the big school in the town. Why? Like one farmer said, "If they studied here, they would come home in the recess and not go back. But if they went to the town, they can come home only when the bus would come at the end of the school day." Some farmers had actually sent their children to study abroad - farmers who perhaps were illiterate, had kids returning with masters degrees from places like US and UK. And they took immense pride while describing their successful children who had become doctors or engineers, and they all thanked the Indian IT industry for allowing their children to go where no one of their own generation had ever gone before. When asked what they would do with any extra money they could get through their efforts, they all, almost unanimously averred that they would spend on their kids' education. Clearly, the people are cognizant of the importance of education . Now the only question is whether a supply can be arranged to meet the demand! 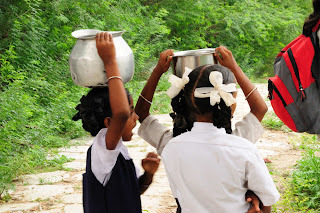 There are some good schemes like Sarva Siksha Abhiyan (http://www.education.nic.in/ssa/ssa_1.asp), but like most good schemes, in need of good delivery and monitoring systems.